Go Shuck An Oyster: She is currently working on an oyster farm for a year. She is currently working on an oyster farm for a year. Many of us dream but only a few turn the dream into a reality. 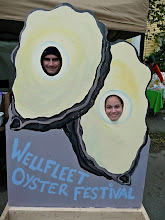 With pleasure I introduce you to Erin, "A 31-year-old, Boston-based online editor and freelance writer who’s taking a break from the media world to work on an oyster farm..." Not just any oyster farm mind you, the internationally known Island Creek Oysters in Duxbury, MA. Spend your free time today reading her blog, Shucked, and you'll feel is if you were on the farm with her. I can even taste the bacon wrapped scallops she recently described cooking and eating. If my local fish market was open this late at night, I would not wait another second to try to cook them the way she learned from Berg. Who is Berg you ask? Take a look at ICOlogoy to find out. For more frequent updates join the 107 other people who follow Erin's every move on Twitter.